This card is die-cut with slots to accept YOUR BUSINESS CARD. A clever way to keep your contact info in front of clients going into the new year. Front: WE WISH SHOE A MERRY CHRISTMAS! Back: AND A HAPPY NEW YEAR! Inside: With hopes that your holidays are decorated with happiness. There is NO Thank You option available for this card. This is a design that often doesn't get considered because folks don't realize how it works. It's got little slots cut through the paper so you can stick your own business card in there - looks just like they're holding it in their mouths! 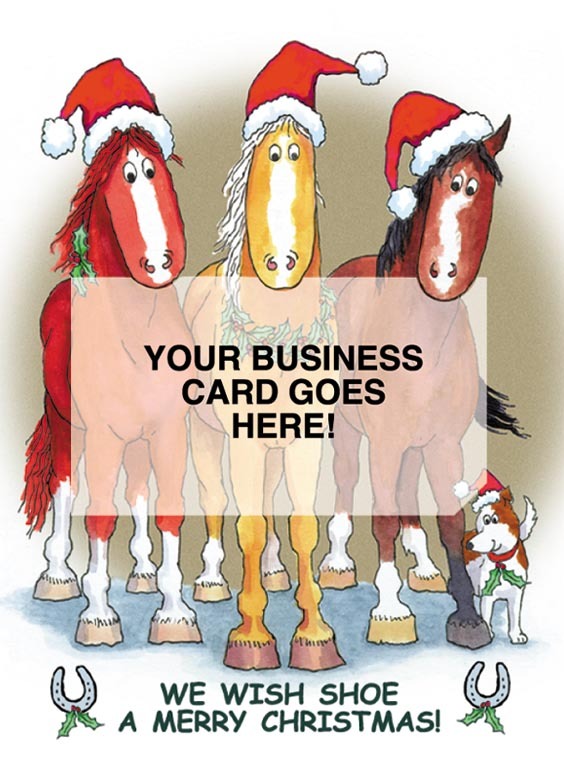 The white square and "YOUR BUSINESS CARD GOES HERE" is NOT printed on the card; you see the rest of the horses - the palomino wears a wreath around his shoulders. The back of this card shows the horses (and the dog's) backsides. It's really cute.